We first checked out Dell's XPS 14z at IFA, a slightly dinkier version of its excellent XPS 15z laptop. The XPS 14z hits stores today and we've already spent a few days snuggling up and getting to know it. While a 14-inch version of a 15-inch laptop might seem a little pointless, we were impressed by how slim and light the XPS 14z turned out. With its 23mm build and 2kg weight, it more closely resembles a 13-inch portable. The XPS 15z wasn't exactly a chubster, but commuters will want to consider this laptop first. 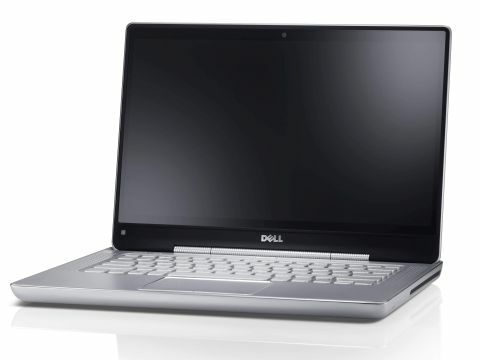 In terms of design, almost nothing except the size has been changed from the XPS 15z. You get the same beautiful brushed metal finish, which feels as solid as it looks – we pushed and prodded every inch and found no worrying weak spots. Even the paper-thin aluminium lid is firm enough to take a pounding, so you won't need to pad your bag with bubblewrap. An isolation-style keyboard fills the centre of the XPS 14z's chassis, bordered at both sides by the built-in speakers. We love the curved design of the keys, which gives them a futuristic appearance. They're firmly set and comfortable to type on, while typos are a rarity thanks to the gaps between each key. The board is surprisingly well-sized too, despite not stretching the width of the laptop. The tiny arrow keys are the only casualty. As with the XPS 15z, the board is backlit for late-night sessions, and Dell also touts it as 'spill-resistant'. However, we didn't have the guts to assault it with a bottle of Evian. Our only issues with the design are the stiff lid hinges, which to be fair at least keeps the screen still when you're on rocky public transport. The screen only tilts 45 degrees back from vertical, so finding a comfortable viewing angle can be tricky when the XPS 14z is resting on your lap.